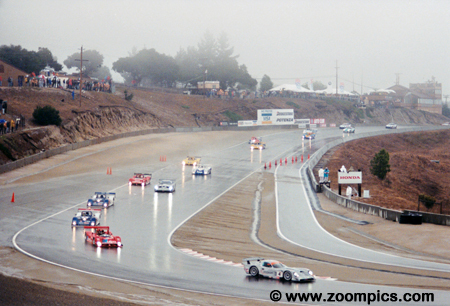 Round-eight of the Professional Sports Car Racing Championship was held at Laguna Seca. 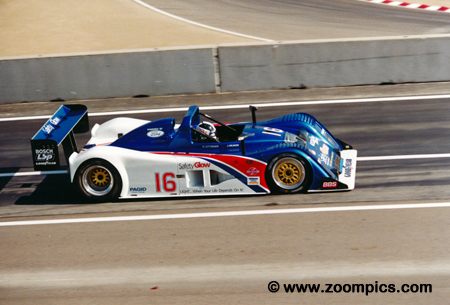 The 1998 Monterey Sports Car Championships was the final race of the season. It was also the final race for Professional Sports Car Racing championship as it would be reorganized and called the American Le Mans Series. Thirty-one entries started the race in wet but changing conditions. This made tire selection a difficult but important strategy. This weekend also included a round of the FIA GT Championship. Sharing the No. 2 BMW-powered Riley & Scott Mk III for Team Rafanelli was Didier de Radigues and Bill Auberlen. During the final, stint Auberlen put on an amazing performance erasing a 32-second deficit in just 14-laps. He maintained the lead and won by almost 6-seconds. This was an impressive feat as he was also sharing a GT3 PTG BMW M3 with P.D. Cunningham. GT1 title contender David Brabham co-drove the No. 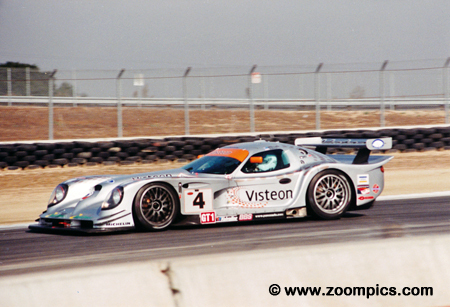 4 Panoz GTR-1 with Andy Wallace. 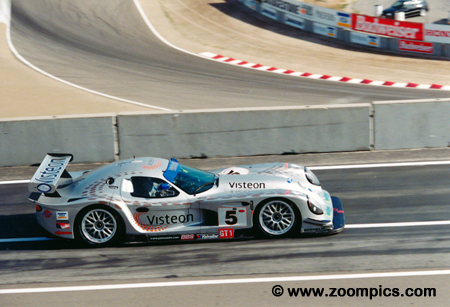 The battle for the championship was between Brabham and teammate Eric Bernard in the second Panoz. The two drivers contested second and third overall in the final stages of the race. In the end, Brabham took the class win and title. Auberlen drove two cars in this race – PTG BMW and Rafanelli Riley & Scott – with only a 15-minute break between switching cars. He started in the BMW which he co-drove with P.D. Cunningham. Auberlen lost the GT3 Championship points lead when Cunningham hit a back-marker and damaged the radiator. This allowed Brian Simo driving the No. 6 BMW to win the Drivers’ title. 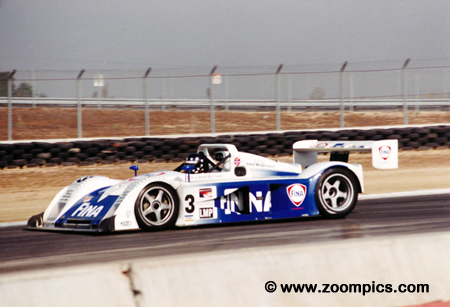 Butch Leitzinger earned his second straight World Sports Car Drivers Championship in the Dyson Racing Riley & Scott Mk III. He co-drove with James Weaver finishing fourth overall and second in class. Leitzinger didn’t have radio contact with the team for the race and was at risk of losing the title by completing too many laps. Fortunately, Weaver stood at the pit wall in his driving gear caught Leitzinger’s attention and he pitted. The first lap in Corner-2 and the racers have to deal with very wet conditions and fog that limited visibility to 50-feet. The start was delayed by 12-minutes and began with two pace laps under a full course yellow. Leading the way was the No. 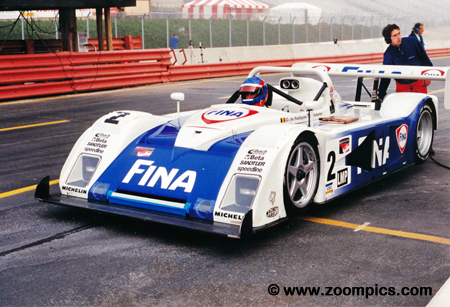 4 Panoz GTR-1 of Brabham followed by the Lista Ferrari and the two Dyson Riley & Scott Mk III’s. 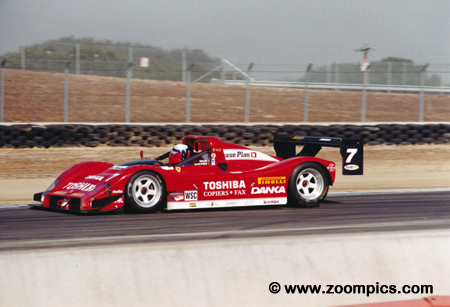 Wayne Taylor shared the Doyle-Risi Racing Ferrari 333 SP with Eric van de Poele. Taylor, a two-time champion, was second in the Drivers’ Championship. An accident in the previous round at Sebring caused him to lose the points lead but he still had a chance to win the title. 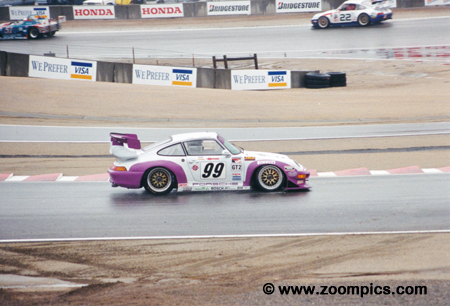 In the wet conditions he and co-driver van de Poele could only manage a sixth overall and third in class. These results left him seven-points behind Leitzinger. The No. 99 Porsche 911 GT2 was shared by team owner Larry Schumacher, Andy Pilgrim and John O’Steen. Despite winning only one event during the 1998 season, Schumacher Racing won the Team Championship and the Drivers’ title for Schumacher. At the Laguna finale, the team started and finished fourth in class. British Touring car veteran Steve Soper shared the second Rafanelli entry with Hans Stuck. Soper qualified third overall but an engine change after the morning warm-up meant he was required to start at the back of the grid. Soper ran as high as sixth but an oil seal failure forced him to retire on lap-20. 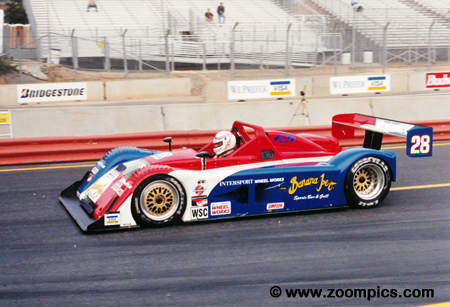 Soper and Stuck were classified thirtieth overall and twelfth in the World Sports Car class. Jon Field and Rick Sutherland drove the Intersport entered Riley & Scott Mk III. At the season finale, the pair started tenth overall and finished fourth in class. During the season, the team’s owner, Field also shared the car with William Brickell, Jacek Mucha, Jeret Schroeder, Joaquin DeSoto and John Mirro. He finished eighth in the Drivers’ Championship. Qualifying second overall was the No. 27 World Sports Car Lista Ferrari 333 SP of Didier Theys. 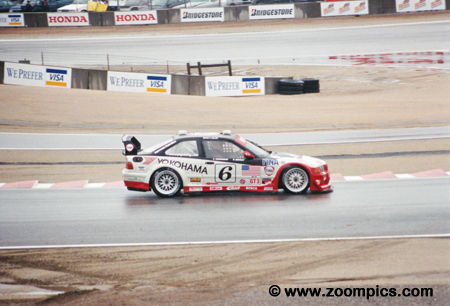 In the race’s wet conditions Theys’ Yokohama rain tires did not work well and he slipped down the order. He spun at corner eleven and made contact with Steve Soper in the Riley & Scott. In the end, Theys and his co-driver Fredy Lienhard finished fifth in class and eighth overall. 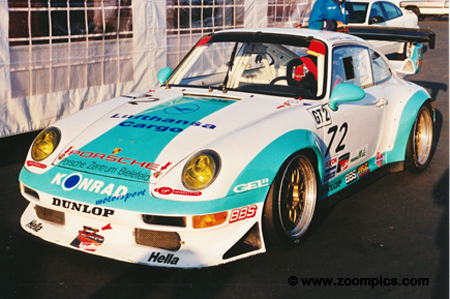 Former skid school instructor Jan Lammers did the first stint in the Franz Konrad Porsche 911 GT2. The rain suited Lammers’ style and he quickly moved into the GT2 class lead. He and Konrad dominated the class finishing fifth overall and 2-laps in front of the Marcos driven by the class pole sitter Cor Euser and Herman Buurman. Nearing the end of the event the No. 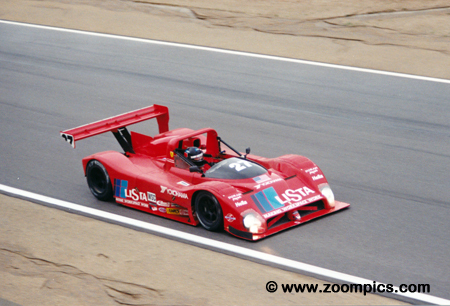 5 Panoz GTR-1 driven by Eric Bernard was leading overall but as the track dried Bill Auberlen began to catch him by as much as 10-seconds a lap. 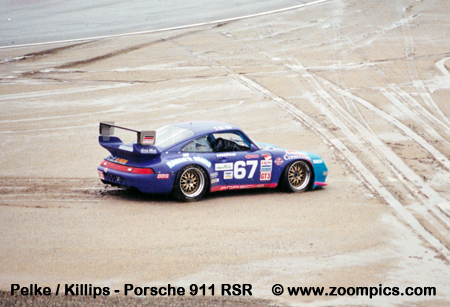 In the end, the car he shared with Johnny O’Connell finished third overall and second in GT1.